With USB 3.1 becoming increasingly common, manufacturers are dropping support for older interfaces in favor of the latest trends. With support for up to 10 Gbps of bandwidth, the new standards seem to leave the once-popular Firewire in the dust. But for most applications, 10 Gbps is excessive. You certainly can’t write to external storage devices at that rate, and many useful devices still perform great through Firewire. But just because you’ve upgraded your computer doesn’t mean that you have to upgrade all of your peripherals as well. If you’ve still got some Firewire devices, adding support to your computer can be a simple and inexpensive process. PCI express expansion ports are found on every motherboard made in the last several years, and provides direct bus access for accessories. We’ll be taking a look at some expansion cards that tap into this common port, and add support for Firewire devices. We’ll help you understand what the specifications mean, and show you how they can be used. After, we’ll help you find the one that’s right for you. If you’re heard of the popular PC retailer Newegg, Rosewill is the computer hardware division of this company. They specialize in importing foreign made components, ensuring that the get the proper quality assurance and certifications required for the North American market. Rosewill hardware is known for being incredibly affordable, and highly reliable. Because the company focuses on volume, they often have those unique adapters or chipsets that can be challenging to find. The Rosewill PCIe Firewire Card is half-height, allowing it to fit into compact cases and systems. There is nothing stopping you from using it in a full-sized system, but this form factor is compatible with virtually any machine on the market. Although it’s sold as a 2-port 1394a card, there are actually three ports located on it. One of the ports is found inside the case. This is useful if you want to wire up something inside the computer, or if you want to route one of the firewire cables to the front of your case. However, as the name implies, only two of these ports can be used at the same time. If you use the internal port, the top port on the card will not function. This card is fully compatible with the firewire 400 standard. It’s important to note that each port has its own dedicated bandwidth. If you plug in two devices, you’ve got 800 Mbits between them. Because this card provides dedicated bandwidth for each port, it’s full compliant with the IEEE 1394-1995 standard, as well as the 1394a-2000 standard. This means that you’ll see stable, consistent read and write speeds, limited only by the type of hardware that you connect it to. Firewire 100 and 200, although less common, use the same connectors. This card is fully backwards compatible with those devices, providing the appropriate amount of bandwidth. 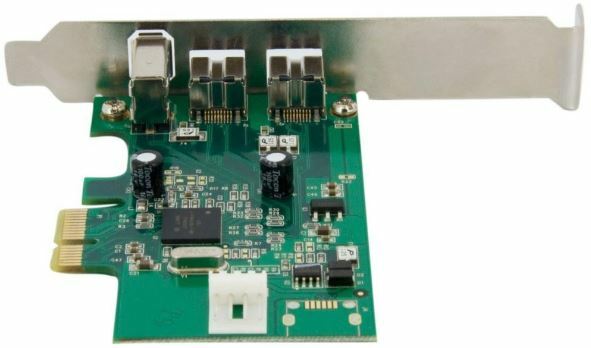 If you’re using older devices, this cards bridge-mode controller is something to look for. When software attempts to communicate with a piece of hardware, it needs to know where to look. Older software that was written before PCI-Express came out won’t be designed to communicate with a PCIe bus. What bridge mode does is communicate directly with the motherboard, giving software direct access to this card. This means that it’s compatible with older software, making it the first choice for finnicky hardware. Another important feature of this card is its compliance with the OHCI 1.1 standard. This is the open host controller interface, a generic protocol that describes how expansion cards such as this one should communicate with modern hardware. By complying with these standards, there is no special drivers needed. Any modern Windows, Mac, or Linux based computer will operate from the moment it’s installed, as they all support this protocol natively. StarTech is the cheap and cheerful alternative to overpriced brand-name peripherals. While a large part of their business is those hard-to-find connectors, they also compete with the big boys on common cables and connectors. Headquartered in Ontario, they design and manufacturer all of their own hardware, generally providing solutions that are a cut above the competition in terms of reliability. Like most add-in cards, the StarTech.com Dual Port FireWire Card is designed to be simple. It’s installed on low profile board, allowing it to be used even in compact integrated systems. The chipset is simplified, with almost all of the heavy lifting being done by a single chip. This reduces power consumption, as well as the amount of heat that’s released into your case. 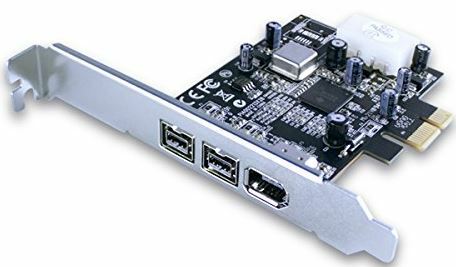 It connects to a PCIe x1 port, although it can still be installed in larger x4 or x16 slots. The layout is simple, with only two 1394a ports located on the back of the card. While this is the most common card type, StarTech.com does offer several revisions of the card for different purposes. There is a PCI version available for older systems, which has three Firewire ports. The Expresscard version is the same as the PCIe, although it’s designed to be installed in the Expresscard slot of a laptop. The 1394B version upgrades the ports to 800 Mbps, for the few devices that require this bandwidth. 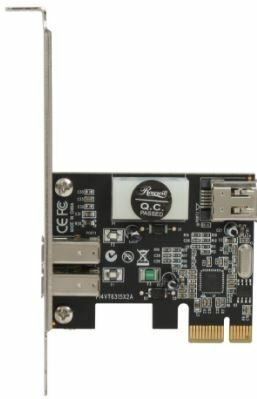 While the bridge mode used in the last card is good for compatibility, the most efficient cards connect directly to the PCIe bus. Most modern software can interface through this bus, reducing latency and improving performance. Because this is a bridgeless card, most users will find that it offers the best performance possible over the Firewire 400 standard. In fact, this card can theoretically function even better than a dedicated Firewire line, although this depends mostly on your hardware. This card also has two dedicated firewire channels, so both of the ports can be used at the same time without restricting bandwidth. If you’re looking at one of the revisions, the performance can differ slightly. The lowest performer is the PCI version. PCI is a very outdated standard, and this version should only be used on legacy systems that do not support PCI express. The fastest card is the 1394B version, which supports the rare Firewire 800 standard, doubling the throughput. Meanwhile, the Expresscard version is identical to the PCIe one in every way, except for form factor. So performance is not affected. This card is designed for modern systems, and offers a high level of compatibility. It uses its own dedicated controller, with a custom coded driver for performance. This driver is now included with Windows 10 and the latest Mac OS, so up to date users won’t need to install the driver. However, a CD is included for anyone who needs it. Unless you’ve got a particularly piece of hardware to get working, we’d always recommend the bridgeless card. It should work with any Firewire 400 device on the market. And if you need support for PCI, Firewire 800, or Expresscard, StarTech.com has a version of the card that will support your needs. Although Vantec is most commonly known for their storage solutions, they also make the parts you need to get them up and running. While Firewire 400 and 1394a are falling out of use, Vantec produced millions of external drives designed for the standard. To support their massive customer base, they created these PCIe Host Cards to ensure their products could be used for many generations. With the Vantec 3-Port FireWire PCIe Host Card, there are three ports provided to users, two of which are external. Unlike the Rosewill card, all three of these ports can be used at the same time. At the top of the card you’ll find a molex connector – the very same used by older style hard drives. These connectors are always found on modern power supplies, and can be connected to the card to provide line-level power. If you need Firewire 800 support, the FW800/400 version of the card moves all the ports to the back. These ports are a little different than Firewire 400, and are not interchangeable. Two Firewire 800 ports are included, as well as a single Firewire 400 port. As a completely unbuffered card, this will have the most stable performance of the bunch. Many digital video equipment and hard drives chose Firewire for its ability to offer rock stable bandwidth, with no fluctuations. To replicate this on the PCIe bus, a special controller must be used. This is one of the few cards that supports that. Because this card operates in real time, a few extra features are supported that we don’t often see. You can hot-swap drives on the fly, unplugging them without having to eject them. It has pass through handshake negotiation with the computer, so plug and play devices will work as expected. Although Firewire was included with many windows PCs, it was most popular with digital video buffs working with Apple computers. There were a few key software features supported on macs that weren’t common on PCs. If you’re using a mac, this is for sure the card you want to get. It’s built to the same specifications as the card included on the Mac Pro desktop computer, so it will work out of the box. The molex power connector also opens up a lot of doors for compatibility. While most Firewire devices have external power, there were a few bus powered devices released. This is one of the few firewire cards that can support them, provided you connect the external power. If you don’t have a free molex connector available, you can still use this card. You just won’t get line level power. 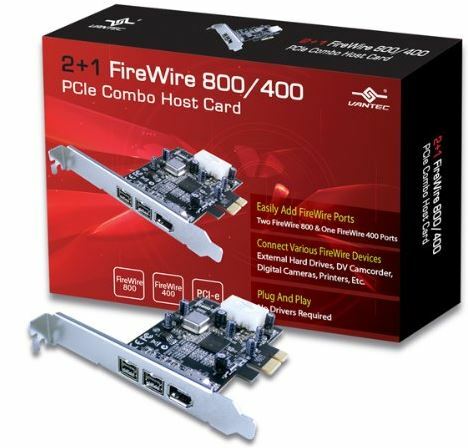 Which PCIe Firewire Card is Right for Me? It might seem like these cards are all the same. In many regards that’s true. But Firewire was a standard in use since 1996, so there are many variations between hardware types. Depending on what kind of computer you have, and what type of hardware you need to use, some of these cards may work better than others. 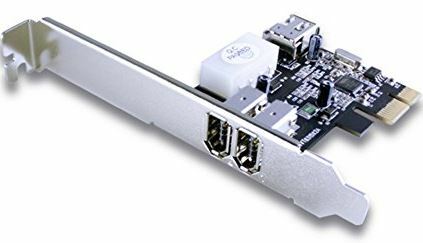 For most users, the StarTech.com Dual Port FireWire Card is the best choice. This card is available in a number of packages, so you can find one that works with almost any system on the market. It’s bridgeless design offers impressive bandwidth and stable performance, giving it the greatest compatibility with any peripheral on the market. Are you trying to get old hardware working with a modern system? 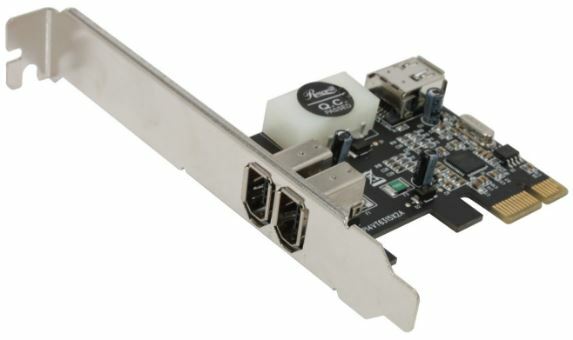 The Rosewill PCIE FireWire Card might be right for you. It bridges the Firewire connection directly into your operating system, so older software knows how to communicate with peripherals. If you’re using a Mac, or plan to use high end digital video equipment, the Vantec 3-Port FireWire Card would be a good choice. This card is built to the exact same specifications as the one used in the Mac Pro, which was known as one of the most powerful digital video computers that money could buy. Do you know if this card have a bridge-mode controller ? Are any of these Linux compatible?